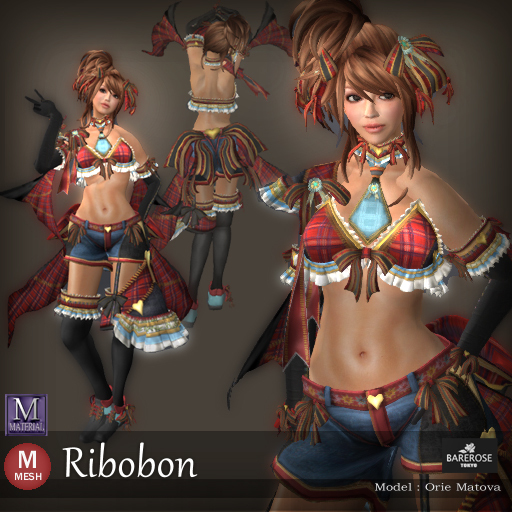 Bare Rose Ribobon is a fun and cute outfit to be in, especially when dancing, swinging and twirling around with the cute little ribbons in red checkered clothes flying in the air. It feels so free! From the front, from head to toes, you will see ribbons and thus the name of the outfit. There are even ribbons on the hair and the cute boots! This outfit is definitely going to turn some heads on the dance floor! The back of the outfit will show you ... more ribbons of course. And the uncovered back, gives you just the cooling you need to make the dance a good one and like Kitty always said, Red with Black, you cannot go wrong on this one!